It's that time of year... canning supplies are on sale in the stores and many are 'putting up' salsa, jams, jelly, green beans, peaches, tomatoes... you name it! I had already posted this recipe years ago, but it's a favorite and the perfect recipe to use up fruit that might be ripe and ready but you've had your fill of fresh fruit to snack on. We just returned yesterday from a quick 2000 mile trip to see family. When we arrived home I found my fruit bowl had a few fruit that were almost over ripe - wanting to be used within a day. That is what reminded me of jam. Homemade jams are so easy and yet, so delicious. Once you start to make them it's hard to go back to eating store-bought. Run your jars and lids through the dishwasher hottest setting. Place the crushed plums and sugar in a large stock pot and bring to a boil on high, stirring. When it comes to a full boil, let hard boil for 1 full minute. Remove from heat. Strain through a wire strainer if a clear product is preferred, otherwise skip that step and add liquid pectin, stir smooth and skim any foam from the top. Ladle into hot jars. Wipe the mouths of jars with a hot wet cloth before sealing. Water bath the jars for 5 minutes. Remove and let cool at room temperature until the lids pop. Store in a cool dry place for up to 1 year. I had this for lunch yesterday and it smelled so good that I almost didn't want to stop to take a picture of my bowl before digging into it. However, I did quickly snap a picture and then just as quickly got my spoon and dug in! I make a version of this for many different varieties of soups. Sometimes I don't even know for sure what kind of soup I'm going to make. I just start with some butter in a pan, chop some onion, add some green or red pepper if we have some fresh on hand... and play with a few ingredients to see what I end up with. Yesterday's soup ended up to be a lovely, creamy, jalapeno and cheese soup that was so thick and hot... just perfectly delicious. 3 small fresh jalapenos, chopped fine (or use canned or bottled - increase or decrease amount up to your tastes) You can even just use the juice/water from the jar of jalapenos if you want flavor but no actual jalapeno pieces. In a saucepan melt butter. Cook onion, jalapenos and green pepper over medium heat until tender. Stir in flour and cook 1-2 minutes while stirring or whisking. Gradually add the milk. Whisk smooth, increase heat and bring to a brief boil then reduce heat immediately and simmer 5 minutes until thick and creamy. Add the mixture of cheeses and the cooked veggies. As soon they melt, serve! While thinking about ways my family would eat rice mixtures, I remembered posting some DIY recipes for easy mixes a few years ago. When I checked, it ends up they were posted here about 5 years ago! Wow, how the time flies! Time to revisit them again! Think about making these and then storing them in an air tight Mason or other canning jar. You could also seal them in Mylar Foil Pouches or a FoodSaver Vacuum Sealer. Although I've never done this, I think you could even put them in a Ziploc and freeze the mix. I've never thought about that one before! Combine the ingredients specified for each different mix, and store each different mix in a glass jar or tightly closed container on the pantry shelf for up to 4 months. To Use: Mix 1 cup of any of the rice mixes with 2 cups of liquid, either water, juice, broth, or a combination along with 2 tablespoons of butter. Place the rice, liquid, and butter on high heat and bring to a rolling boil. 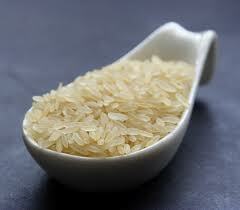 Immediately reduce the heat to very low, cover and simmer the rice for 10-15 minutes or until all the liquid is absorbed. To cook in a microwave, combine the rice, liquid, and butter in a 1 1/2 quart casserole, and heat, uncovered on high or full power for 12 minutes. Top and stir once or twice during the cooking. Cover the casserole and let rice stand for 5 minutes before serving. Variations: It's easy to make a meal in one pot if you sprinkle a cup of rice mix around a roast or several meat or fish pieces before baking. Just remember to add 2 cups of liquid, cover, and bake for at least 30 minutes or until meat is tender. Or, try serving the prepared rice combined with stir fried vegetable, shrimp, or chopped ham. When making Spanish Rice, it's a good idea to use tomato juice or sauce as the liquid. The mixes make 32 oz. each. Although I've posted my classic white dough recipe previously, many visitors to my site don't visit every day, but pop in as they can or if there is a certain recipe they need. For that reason I don't mind posting a recipe again if I've happened to have made it again. And I have. These are homemade rolls I made to go with dinner earlier this month. They were so hot and tender and perfect that my daughter and I both had 2 straight from the solar oven, when they were hot and fresh... even though it was only about a half hour until dinner! Snitching before dinner isn't always a bad thing; not when they are as good as these! Can be used for bread, buns, cinnamon rolls, garlic bread, etc. Either place this in a bread machine (in the order your machine requires) and run on the dough setting or place into a large KitchenAid style mixer with a bread dough hook and knead/mix for up to 10 minutes. I used the electric mixer and placed the water, salt, sugar and yeast in first; let it set and proof for about 2 minutes and then added the butter, dry milk and flour. Let your dough set for about 10 minutes after kneading to rest. Remove the dough from the machine or the mixer bowl. Divide it in half. Then each half into half. Then each of those halves into half. This is how you will get fairly equal sized balls. If making rolls to go with a meal divide them until you have golf ball sized balls. If using for hamburger buns, stop dividing the dough when they are double that size so they will be large enough for the hamburger patties. Roll and flatten a tiny bit in your floured hands and place on greased or parchment lined baking sheets. Let rise according to what you are making; until about double in size for rolls, breads, buns. Bake at 375F for approximately 15 minutes but this can be up to 22 minutes depending on the size buns you make, the thickness of your baking sheet and your oven. When they are golden brown remove them, brush the tops with butter for a softer bun and let cool to warm to serve as rolls or cool completely and serve as hamburger buns. Since the mid 1990's this is my all time favorite way to prepare cole slaw. It's so very similar to the taste of KFC's version and just so good with everything from BBQ to Burgers, from Fried Chicken to Fish... well, anything! Sure, they may look like an appetizer you would serve at a party or holiday buffet table, but no, I make these for my family. They are so pretty, but so incredibly yummy! I like to use a nice buttery small baby potato, but you could any tiny bite sized potato if you wish. The amounts are completely up to you on this one; I'll give you a starting point but you can always increase or decrease the butter and sour cream based on your own preference. Yes, these can be made ahead! You can prepare them ahead of time, place them in the refrigerator and just pop them into the oven to finish before serving to guests. Boil or bake the little potatoes just until tender but not mushy. They need to be slightly firm. Drain them if you boiled them, and let them cool a few minutes until you can pick them up to work with them. Slice them in half, and scoop out the insides, placing the scooped out portion into a bowl. You can use a measuring teaspoon or melon baller to scoop out the insides. Place the scooped out 'bowl' half into a well oiled baking pan. Mash the scooped out portion in the bowl with your seasoning, butter and sour cream. Use your 'taste test' to see how much of the herbs and spices you want to use. Potatoes are very bland so make sure you use enough to add flavor but do so bit by bit so you don't put too much in! If you want your potato boats to be crisp you *can* bake them in a 425 degree oven unfilled at this point and fill them with the mashed filling after. I don't usually do that. I like to scoop and fill them with a melon baller, then top each with bacon crumbles pressed slightly into the potatoes to stay, and finish with a few sliced chives or tops of green onions. At this point you can serve as is, you can return to a hot oven and bake about 15 minutes to heat and crisp, or you can refrigerate them and bake them later when you want to serve them. Very versatile! *** I cooked my potatoes in my Global Sun Oven® - you can cook yours by boiling, baking or if it's 110 degrees like it was here that day, use your Solar Oven! One of my Grandmothers is, and always has been a fabulous cook. After she raised a kajillion kids (ok, 8) my Grandfather passed away so she bought a pizza restaurant/arcade in a town near where she lived and she worked the restaurant for a few years before moving to the town where we lived and she started working as a cook at the local nursing home. Always cooking! By the time she moved to the town where we lived I was getting ready to be married and move 2000 miles away, so I never really knew her all that well, but there is one thing that pops into my head whenever I think of her. Sour Cream Raisin Pie. Her favorite. I remember this because every year at the holidays she would make about 5 pies and without fail there would be a sour cream raisin. That is probably why, as a 4 year old, I remember this pie so well! They made me eat it twice (that I remember) and I painstakingly picked out every single little raisin. I may be an adult now, but I still painstakingly pick out every single little raisin. (I'll do the same thing if you try to put raisins my Thanksgiving stuffing, cinnamon bread or even salads!) Oddly enough however, I love Raisin Bran Cereal. Go figure? For my Grandma H - this one is for you! Cut the salt and shortening into flour until crumbly. Add the egg, vinegar and milk. Mix to form dough. Roll out into circles to form 3 pie crusts. Bake 1, 2 or 3 of them. You can freeze the extra crusts for future use or make more pies. Beat until mixture forms stiff peaks. To stabilize the meringue, mix about 1/2 t corn starch with about 2 T water and microwave in a mug or cup until thick. Drizzle this into your egg mixture and beat stiff. Top the raisin filling on the pie. You can serve the meringue as is or finish it off by placing it under the broiler until the tips are golden. Last night we had grilled steaks and grilled potato coins for dinner. When we have fries or any sort of wedge style potato, my 16 year old and I open the cupboard and grab a handful of spices to season them with. We don't worry about using the same spices each time, but we do have a general idea of what we like. The photo above starts with the new Orida Grillers potatoes. They offer a seasoned version and a plain version, but the grocery store I shopped at only had plain. No worries! I grabbed a handful of spices and they turned out fabulous! My only note is to go heavy on the spices - potatoes tend to be bland and take quite a bit to really shine. Lay the potatoes on a greased plate or sheet. Sprinkle liberally with the spices. Flip and repeat if you like, although I just did the one side. Sprinkle lightly with flour and coat with a nice even layer of oil (which is why it's so easy and fast with PAM or other spray). Now, grill as per directions for about 13 minutes. We *love* this new product. They reminded me a little bit of the flavor of Shakey's MoJo's. Even though we had just finished a relocation across the country and were in a new house with absolutely no place to put in a garden... I did it anyway. Just a small one I worked into our landscape on the side of a hill. The primary reason for the garden was to grow ingredients for my homemade salsa. We were at a stage this week where I didn't have enough ripe tomatoes to make a batch of salsa, but my husband was asking almost daily if we had enough yet? Could I make salsa yet? He sure missed my homemade salsa.... so I gathered up what we had and it was enough to make half a batch. So, dear readers; half the recipe if you wish. Halved, with about 5 cups of chopped tomatoes, will yield about 4 pints. Canning your salsa, you will need two things for sure; a large enough pot to boil the jars in water that covers their lids and, canning jars with lids and bands . I don't have an official 'canner' - I have a soup pot. But it works great for me and since I'm not canning low acidic foods like green beans or meat, I don't have to use a pressure canner. Water baths work just fine. An item I would suggest you get to save yourself burnt fingers; a jar lifter . This is something I didn't use the first couple years, I just tried to hold on to the jars with a towel as my 'hot pad' holder. Once I invested in a cheap jar lifter I was amazed at how easy things became! To peel/skin your tomatoes easily just put them in boiling water. Skins will split in 10 seconds - 2 minutes. Remove as soon as the skin splits and lay on a clean towel to cool until you can handle them comfortably - or you can dip them into a bowl of ice water if you wish. Some tomatoes won't split but they are still ready; if it has been in the water for approximately 1-2 minutes, lift it out and feel it. If it looks tight and ready to burst, yet it feels like a water balloon, then remove it to cool. It's ready. The second your fingers or a knife touch the skin it will probably split on contact. Tomatoes can be seeded and the juice canned separately or you can use the whole tomato in your salsa and skip that process. Up to you. Mix all the ingredients for your salsa and simmer 1-3 hours. While simmering, be sure to either run your jars and lids and seals through an extra hot dishwasher cycle or boil them in another pot of water so they are hot and sterilized when you are ready to use them. Ladle salsa into the jars with about 1/2 inch head space at the top. Wipe the edges completely clean with a clean cloth and place the lid on it and then the ring. You don't have to tighten them hard - just a quick twist to hold the seal/lid on during the process. Now, originally this old time recipe did not call for a water bath. The heat from the salsa and the jar will seal the lid. However, I like to boil them in a water bath as an extra precaution for 25 for pints. Remove from the water, set on a towel on the counter and let them cool at room temperature. You will hear popping noises. That is the lids sealing. When completely cooled, store in your pantry or cupboard. The skins will split within about 30 seconds and they literally slip right off. Chop your tomatoes. No need to be concise. They will cook down. Just chop quickly and toss in. *updated to answer the comments; Yes - in American cooking/baking, a little "t" always always teaspoons in recipes and "T" equals tablespoons in recipes from all sources. Sometimes we don't need a recipe so much as a simple reminder that something exists. A moment when you say, "Oh yeah! I forgot about those!" or "Oh my gosh. That is so easy, why didn't I think of that!" Popsicle's are one of those things. I happen to be lucky in that my mother cleaned out her kitchen a few years ago and gave me the original Tupperware Popsicle trays my brothers and I used as a child. These are the real deal from about 1973! Today there are a kazillion versions available - you can order them online (Frozen Treat Trays) or even find some at your local Walmart or dollar store. You can fill these with any fruit or liquid you wish! A few days ago I posted a recipe to puree fruit and make healthy fruit pops with no sugar. Simply mix, pour, freeze and enjoy! Today is a little 'anniversary' of sorts. It was one year ago today my daughter relocated to our current city and state with my husband - opting to live with him in corporate housing during our relocation while I stayed up North selling our home. She was so very, very excited to move 'down South' - she couldn't wait! My husband had relocated in May, and I was able to join them last winter after our home sold, but today is officially one year for her. In honor of my daughter's 1 year Anniversary of moving to the South I made us all these cupcakes. I whipped them up quickly starting with a cake mix but to make them more substantial (I don't like the airy, squishy texture of store bought mixes) I added to the batter to make it more sturdy and more like homemade. The icing is my all time favorite filling/frosting and although these don't have to be refrigerated, please consider doing so, as the icing and cupcake taste so good chilled! Mix well. If it is too thick add a bit more milk, a tablespoon at a time until you are happy with the consistency of the batter. Fill cupcake liners 3/4 full. Bake at 350 degrees until golden brown and done in the center (about 20 minutes give or take according to your pan color and oven). Cool completely while you make the frosting. Cream the Crisco and butter. Add the sugar gradually and then the creme and vanilla. Beat well until it's smooth like whipped cream. Decorate your cupcakes, sprinkle if you wish. Chill if you desire. What's for Breakfast? Biscuits! Tender, flaky, mile high Southern biscuits! I'm not normally a 'breakfast' kind of girl, but when my morning starts extra early and by 8:30 I've been up for almost 4 hours, I find I'm hungry and ready for something. This morning is one of those mornings! Thinking about what I was really hungry for, I realized I wanted a hot, tender, flaky Southern biscuit with just a tiny schmear of butter. This is my favorite biscuit recipe - and one of the first ones I ever posted on An American Housewife almost six years ago although it's the recipe I've been making almost exclusively for the last 16 years! Place the flour, baking powder and salt into a large bowl and stir or whisk together. Add the butter in pieces and 'cut in' or pinch with your fingers until crumbly. Stir in the sugar and add the milk all at once. Mix with a fork until it holds together. Remove the dough and pat into a 1 inch high rectangle or circle with your hands on a lightly floured surface. Using a biscuit cutter or a circle cookie cutter cut straight down, do not twist! You can use a knife and slice the dough into squares if you don't have a cutter. Place on an un-greased pan. Brush with melted butter if you prefer and bake 12-15 minutes at 450. 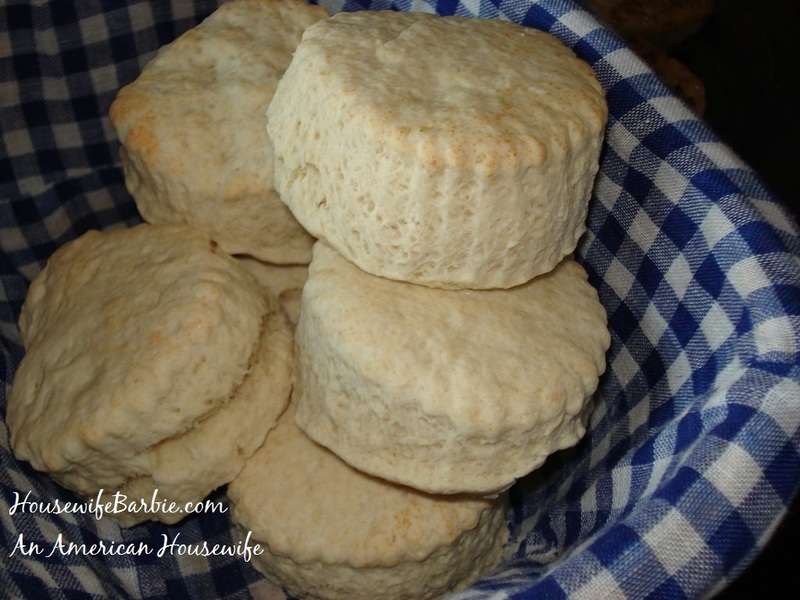 These biscuits are so tender they can wrapped and reheated the next day. What a whirlwind weekend... but a fun one. No new recipes have been posted the last few days as my husband and I were celebrating our wedding anniversary. I'm home now and after spending yesterday getting our pets settled back in the house and doing a marathon grocery shopping trip to three different stores, I'm read to jump back in with both feet! I'm going to pull one of my recipes one of the old draft files I have saved here on this site that have been waiting to see the light of day. I've picked this one because we stayed a resort this weekend and ate at their restaurant. The food really was not very good at all and one of the dishes I had had was a Seafood Soup (their word; soup - not chowder). It was barely lukewarm, was a thin, tomato based soup with a few itty bitty pieces of seafood (I couldn't tell what they were) and mostly was filled with sausage coins. Not impressed! I think this one sounds much better. Cook the potatoes until tender, but not too soft, about 20 minutes depending on the size (a knife should pierce the potato fairly easily). Drain the potatoes and set aside until cool enough to handle, then peel and cut the potatoes into one-half-inch cubes. Set aside. In a large, heavy-bottom pot, sauté the bacon over medium-high heat until it renders its fat and becomes crisp, 5 to 7 minutes. Strain the bacon, leaving the fat in the pan. Add the celery and onion and cook in the fat until the onion is translucent and the celery is softened, 6 to 8 minutes. Add the butter and melt over medium heat. When the butter is melted, whisk in the flour to form a blond roux. Stir in the garlic, sage, parsley and thyme. While stirring, slowly pour in the seafood broth. Stir in the potatoes and bacon. Increase the heat to medium-high and bring the mixture to a boil, stirring frequently. Taste and season as desired with salt and pepper. Decrease the heat to simmer for 20 minutes. After 20 minutes, stir in the half-and-half, tomatoes, green onions and seafood. Simmer gently until the seafood is cooked through. Taste again and adjust seasoning as desired. Remove from heat and serve immediately. This makes about 4 quarts. Do you have someone in your family who looks at you like you are crazy when you say you want to have fish taco's? I have a family member who quote; "Doesn't like seafood" who went crazy over these fish taco's last week. I made grilled fish and grilled chicken to give a choice of fillings, but once she tried the fish she remarked it 'doesn't even taste like fish' - which basically meant they aren't 'fishy' - just good! The sauce is what I love most of all. It really brings this together! It's a hodge podge mixture of 4 different recipe idea's, but the end result was a 'keeper'. Whisk the ingredients for the marinade together, put in a Ziploc Baggy (or whatever you use to marinate) and add the fish. Refrigerate at least 6-8 hours, flipping every now and then so it's all covered equally. While it marinates, make the dressing. Whisk ingredients together and refrigerate until it's serving time. Grill your fish until flaky and done. This is usually about 10 minutes. Serve the sliced fish with sides of the sauce, shredded cabbage, diced tomato, guacamole, and extra lime slices if you wish. Enjoy! The fish, sauce and cabbage come together... just right. I love seafood and one of the many ways to enjoy it is in seafood lasagna. I planned on making it for dinner last night but my daughter begged me to please make a Chicken Alfredo and Spinach Lasagna instead (her favorite) so I didn't make this one after all. She loves anything chicken and Alfredo while I love anything seafood! Saute the onion in a skillet with the oil and 2 T butter. Stir in broth and clam juice. Bring to boil and add scallops, shrimp, crab and a little salt and pepper. Return to a boil. Reduce heat, simmer, uncovered for about 4 minutes until the shrimp are pink and scallops are opaque. Drain - but save the liquid. Set aside. In a saucepan melt the butter, stir in flour til smooth. Combine milk and reserved liquid, gradually add to the pan. Add salt and pepper to taste. Bring to a boil for 2 minutes, just until thick. Remove from heat and stir in the cream and 1/4 c of parmesan cheese. Stir 3/4 of the white sauce into the seafood mixture. Spread 1/2 c white sauce in the bottom of a greased 13X9 pan. Top with 3 noodles to cover. Spread half the seafood mixture over and then 1 1/4 c sauce. Repeat the layers. Top with the final pasta layer, sauce and remaining Parmesan. Bake uncovered at 350 for 35-40 minutes. Let this stand for 15 minutes before cutting so it will set up nicely. What smells like an apple pie, looks like an apple pie, tastes like an apple pie... but isn't? A Zapple Pie! (Or, at least that is what our family has always called it!). Years ago I started to make this pie to use up Zucchini from our over-abundant garden. It is a family favorite, so it gets made often and I've post the recipe a couple times on An American Housewife. This time around I did two things differently. First; I baked it in a Solar Oven since it was about 105 degree's out and I didn't want to start my oven and heat up the house and second: I found out in the middle of the recipe that I was out of lemon juice. I substituted lime juice and guess what? It was fabulous! Tasted almost the same and no one could even tell. So, there you go! Easy way to scoop out the seeds! It looks like apples doesn't it? Nope! All zucchini. Ready for the top crust! Normally I 'pinch' seal but this time I showed you how to use a fork to seal the edges. I baked mine in a solar oven but obviously most people use a regular conventional oven.